The National Oceanic and Atmospheric Administration (NOAA) announced on Thursday that after eight months of flirting with El Niño, the climate phenomenon finally stopped playing hard to get. But before you get to hype, I’m sorry to report this is a weak-arse El Niño and any impacts it has on weather will be limited. Scientists have been watching ocean temperatures in part of the eastern tropical Pacific known as the NINO3.4 region for signs of El Niño. To officially declare it “on”, temperatures there must be 0.5 degrees Celsius above normal for three consecutive months and appear likely to stay that way for the next few months. Temperatures cleared that threshold in October, and models have remained bullish they’ll stay there. As of early February, NOAA said sea surface temperatures in the region were 0.8 degrees Celsius above normal. 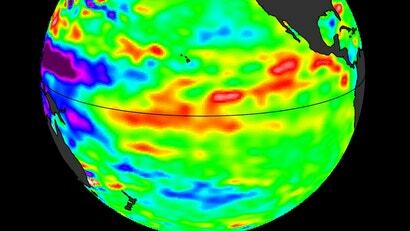 But there was a missing component that held up NOAA from making this El Niño official. But while ocean temperatures and the atmosphere are finally united, it’s not exactly a match made in heaven. Because this isn’t a smouldering El Niño like the one that roiled the world from 2014-16, its impacts are likely to be limited. Over the course of that previous Super El Niño (yes, it’s a thing), the oceans heated up, harming corals everywhere. Droughts struck East Africa and Australia. The southern U.S. also saw a few heavy rainfall events, which are again in line with El Niño’s impact on the weather. This time around, NOAA suggests a more tepid series of impacts. Using a suite of climate models, NOAA forecasts that this El Niño could last until June, fading away just in time for Atlantic hurricane season. That’s unfortunate since El Niño tends to dampen hurricane activity. And even though this is a weak El Niño, it could still have one other unfortunate impact: lifting the planet’s temperature. Pile the heat of El Niño on top of the global warming, and you’ve got a recipe for searing global heat. The two hottest years on record occurred during the recent Super El Niño. This year isn’t expected to top those two years, but it’s likely to be warmer than last year which clocked in at the fourth warmest since record keeping began. So even though El Niño is likely to fizzle halfway through the year, its uncomfortably warm memory could live on.